Figure 4.1 (A,B) Hard-contact wound with blackened seared margins. Loose-Contact Wounds. In loose-contact wounds, the muzzle, while in complete contact with the skin, is held lightly against it. 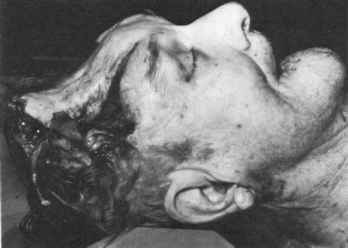 Gas preceding the bullet, as well as the bullet itself, indents the skin, creating a temporary gap between the skin and the muzzle through which gas can escape. Soot carried by the gas is deposited in a zone around the entrance (Figure 4.2). This soot can be easily wiped away. A few unburnt grains of powder may also escape out this gap and be deposited on the skin in the zone of soot. 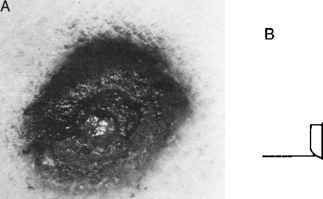 Figure 4.2 (A-B) Loose-contact wound with soot deposited in zone around entrance. Angled-Contact Wounds. In angled-contact wounds, the barrel is held at an acute angle to the skin so that the complete circumference of the muzzle is not in contact with it. Gas and soot escaping from the gap, where contact is not complete, radiate outward from the muzzle, producing an eccentrically arranged pattern of soot. The soot is arranged in two different zones. 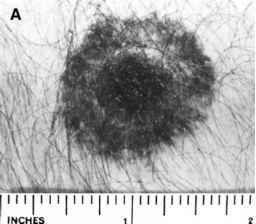 The most noticeable zone, and often the only one seen, is a blackened seared area of skin or cloth having a pear, circular, or oval configuration (Figure 4.3A). Less conspicuous is a larger fan-shaped zone of light-gray soot that radiates outward from the gap. On the skin, this light zone is usually washed away, obscured by bleeding or removed in cleaning the wound for examination. A few unburnt grains of powder may be deposited in these zones. The entrance wound is normally present at the base of the seared blackened zone. All or at least the majority of the seared blackened zone will be on the opposite site of the wound from the muzzle, and thus "points" the way the gun was directed. 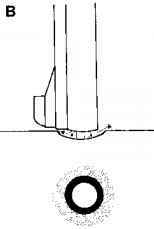 As the angle between the barrel and the skin increases, i.e., the barrel moves toward a perpendicular position to the skin, the entrance hole will be found more toward the center of the zone. If the angle between the barrel and the skin decreases, the gap between the muzzle and skin becomes larger, and more material can escape through the gap. At some point, the gap becomes sufficiently large that unburnt grains of powder escaping through the gap will skim over the zone of seared skin, fanning out from the entrance, impacting distal to the entrance wound in a fan shaped pattern of powder tattooing (see Figure 4.3C). Incomplete-Contact Wounds. Incomplete-contact wounds are a variation of angled-contact wounds. In these, the muzzle of the weapon is held against the skin, but, because the body surface is not completely flat, there is a gap between the muzzle and the skin. A jet of soot-laden gas escapes from this gap producing an area of seared, blackened skin. The location of this seared, blackened zone can be anywhere in relationship to the muzzle circumference, depending on where the gap is. Incomplete contact wounds are most often seen in self-inflicted contact wounds of the head due to long arms, i.e., rifles and shotguns. In these cases, a zone of blackened and seared skin extends downward from the entrance. The most probable cause for the appearance of this wound is a momentary break in contact between the muzzle and skin along the lower margin of the barrel as the victim reaches for the trigger with one hand while holding the muzzle against the skin with the other hand. 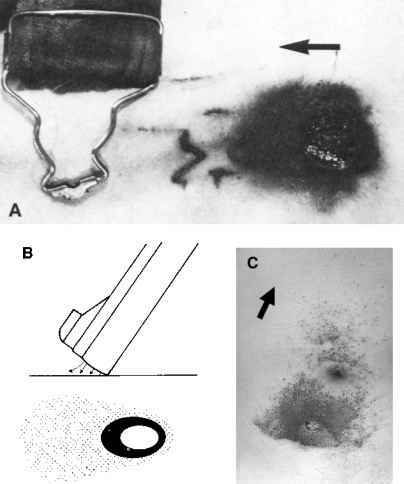 A jet of hot sooty gases escapes from the gap producing the elongated blackened and seared zone of skin (Figure 4.4).1 Scattered grains of powder may accompany the jet of gas and be deposited on the skin. Figure 4.3 (A-B) Angled-contact wound with seared blackened zone of skin on opposite side of wound from muzzle pointing the way the gun was directed. (C) Angled-contact wound with powder tattooing on opposite side of wound from muzzle. In all contact wounds, soot, powder, carbon monoxide, and vaporized metals from the bullet, primer, and cartridge case are deposited in and along the wound tract.